I’M ON MY GRIND. You’ll find local spooks galore at the EC Ski Sprites’ Haunted House in their new location downtown. Halfway up the Dewey Street Hill – in a block of darkness – in a non-descript gray cement building with the windows painted over – projecting out of THE slope of the hill – with newly added bright orange neon lights on the roof – is downtown Eau Claire’s only haunted house, the Van Krumple Mortuary & Crematorium. Van Krumple will come alive, so to speak, for three long weekends in October with cold human corpses waiting for identification, or removal for an autopsy, or disposal by burial, burning, or other methods. Yes, Eau Claire’s premier Halloween attraction sponsored by the Eau Claire Ski Sprites is baaaccckkkk – with all its howling, scary, and interactive success – for the first time in downtown Eau Claire. Prior to this year, the Ski Sprites’ Halloween Hauntings were at the Eau Claire Expo Center for more than a decade. Thanks to their new neighbors, Hillside Dental (which is selling the building to the Ski Sprites) the club will no longer have to haul the makings of its haunted attractions in three semi-trucks. 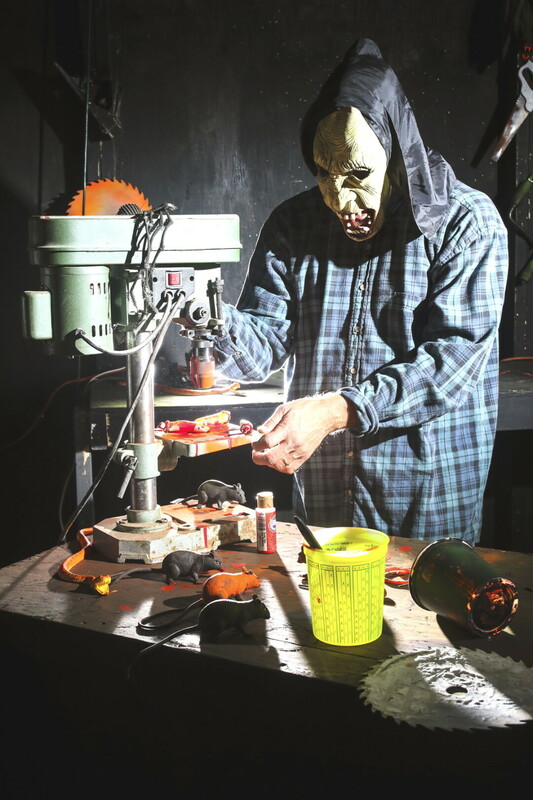 The creation of Van Krumple comes from the mind of Jeff Ludwikowski, who makes it his mission to study other Halloween hauntings to find the scariest, the most realistic, and the most interactive experience. Over 80 Ski Sprite member volunteers – water skiers, their parents, family members, and friends – spend countless hours building the sets and horrifying displays. And then each weekend, some of them actually transform themselves into eerie beings to participate in the weekend events. The Ski Sprites are also partnering with the UW-Eau Claire Water Skiing Club and Boy Scout Troop 90, who are providing sweat equity for the event. Due to the scare factor of this attraction, the event is not recommended for young children under the age of eight. All funds raised through the haunted housesupport the Ski Sprites, who perform two shows a week all summer at Lake Altoona County Park. Learn more about the Ski Sprites and their haunted house at www.skisprites.com. Thursday-Saturday, 7 p.m. to 11 p.m.